Back at the house I inherited, when I last lived there, we only got to see Swifts at an Aunt’s house (very close to the favourate countryside spot), but these days they are in the skys above the house. So what with the Robins and Blackbirds singing on and off from 5am to now (21:15), the wood pigeons and collared doves, Red Kites all singing away (plus many others on occasion), the soundscape is much more varied – but plus emergency services sirens, reversing lorry warnings, footballs hitting my cars – in a rather more built up surburbia than this identical spot 25 years ago. 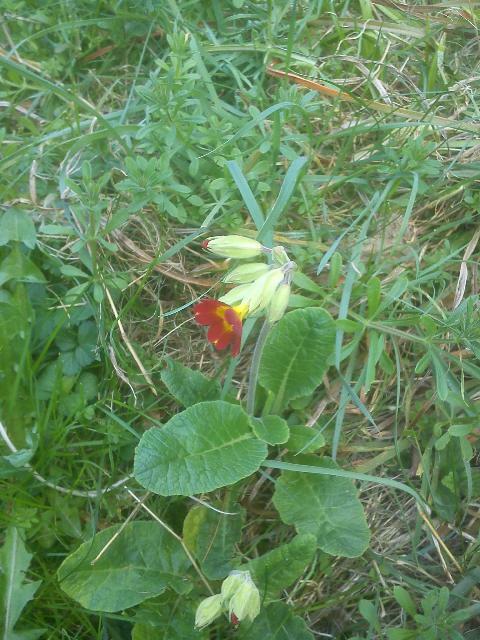 Meanwhile in the garden is my “Red Cowslip”. It’s been here for at least 20 years, sometimes I dig up one of the daughters to try and propagate it, but haven’t really succeed with that, being in the lawn it sometimes gets cut down. A few years ago it was a sizeable clump, but it’s currently down to these two plants. 40-odd years ago, there was a school class competition to identify as many wild flowers as could be found. A copy of the Rev Keble Martin’s ‘Concise British Flora in Colour’ was the ‘Bible’ to rule out garden escapees. I later was given a 1/3rd size paperback copy of the book, which I still have. Then you were supposed to pick a flower to show you had found it – mostly illegal these days, but also just about everyone has a camera with their mobile phone (as the picture above) so there is no need to pick the flower (although I have seen evidence of picked flowers). 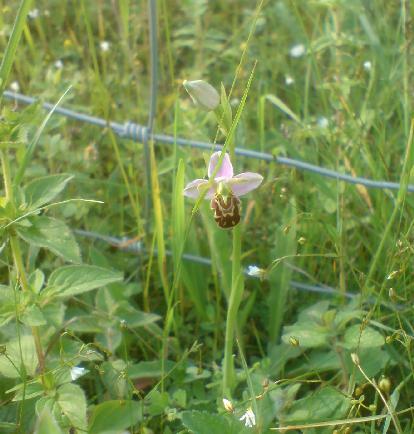 Over that weekend, my family went to what is now my favourate location, and there, in the middle of the path, was a Bee Orchid. I could not believe it, but nor could I say anything about it. 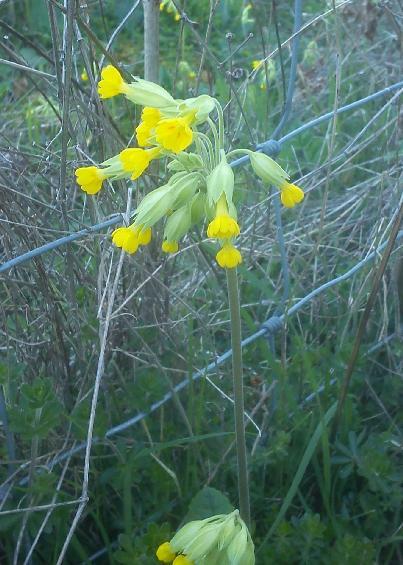 The path had been diverted away from where the orchid had been many years ago, and in any case there were many years in between when wild flowers that I knew used to be there – cowslips, for example – had disappeared. After the death of my mother, my brother and I went for a walk there, partly as a memorial walk. Walking along what is a new path, provided by the landowner in order to enclose much of the land, I suddenly noticed a rather familar form – it was a bee orchid, post flower, with seed pods – again, in the middle of the path. So last year, at about the expected time, and now spending time at the weekends rather closer to it than in the week, I made weekly visits. So, at the appropriate time, I found eight plants – the one in the path, and another seven around or just beyond the fence put in by the landowner. This year was different. The one in the path has disappeared; the other seven were again flowering (as above), but a load of bushes have been planted staight through where they were in order to form a future hedge. But further along, on the fence of the next field, I found two more. BUT last week I found only one. All those others that had flowered had disappeared. I had checked my location carefully, as I had recorded their location by landmarks – well, fenceposts. I had kept quiet about this while the plants were thriving, but it seems that they have been removed – before the seeds could have ripened. Because of an expected rainstorm – which came rather later than predicted – I didn’t visit the site this week. There are plenty of other orchids in the area in the past few years – Common Spotted Orchid, Dactylorhiza fuchsii and Pyrimidal Orchid, Anacamptis pyramidalis, again they appeared to disappear for so many years after those visits 40-odd years ago, but there were hundreds if not thousands of these at this site. I do remember another site, where we were taken by my father, where a crowd of people were watching a farmer plough up a meadow full of orchids, but I have no idea where that was, it is just a memory of sitting in a field surrounded by orchids while the tractor got closer. However, I do wonder if these flowers (and the cowslips that are present again) are not botanical analogues to the Red Kites that circle around above – recent re-introductions from populations from other countries. The South of England is having it’s first real cold snap of this winter. Nothing like last winter, of course, I remember snow laying on the ground in November, all that we’ve had so far are a few frosts. Such is the cost of electricity, I’m keeping a careful eye on the greenhouse. My method of one fan blowing all the time, and another that comes on just to supply heat, just to keep the greenhouse frost free seems to be working at present. The minimum temperature recorded on the bench was 1.1C, the fan heaters are beneath the bench and blow away from it. 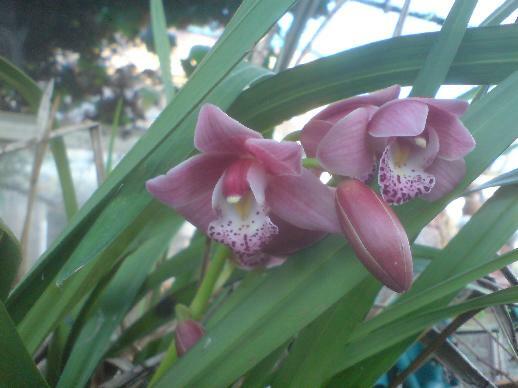 And the plants themselves don’t seem to be suffering – four different Geraniums (one still in flower, just), and three cacti (one died last summer for unknown reasons) are OK, while the Cymbidium has opened the first of its buds. If we were in for a real cold snap like December 2010, when the average temperature for the month was -1C, I’d be putting a lot of bubble-wrap insulation in the greenhouse, but while its not to bad, and I’ve an awful lot of other ‘real’ work to do, that job is rather lower down on the ‘to-do’ list. While I have been the sole user for the past few years, this year is really the first time for decades that I’ll actually be able to do anything serious in what is now fully and completely, no question about it, MY greenhouse. Although there is the continuing war with the Ivy to deal with, and to a rather lesser extent, bindweed (Convolvulus arvensis). The other thing to deal with are all the broken panes. Some of these breakages are due to the Ivy. Not for the first time in recent years, has there been a mild October and November – although I believe this year was record breaking. A few years ago, when we were having a new roof put on the block of flats, the roofer disappeared for weeks, during that fine, mild autumn, and when he then complained about trying to finish the work in a cold wet December – he finished on 24th(!) – I pointed out the weeks of one of the best Autumns for years when he was away [doing other jobs, no doubt] – he pretended not to hear me. Preparations this year are different and it is probably worth giving some detail as it gives an idea of the current situation chezes (sic) moi. For I have three places to look after, still. The Greenhouse is tricky, for the second heater appears to have developed an erratic thermostat. Not that I thought much of the thermostat, or indeed the heater as a whole, to start with. Using the remote sensor system, as previously blogged about, I’ve gone out late at night on more than one occasion to try and adjust the heater down, for it was holding the temperature too high. It’s not that it really needs the heat yet (even this late in the year), but I want it working correctly for when the frost/snow does finally arrive, especially if I’m not around to fine-tune (or even, coarsely adjust) the heater. Or get yet another heater. As for the last two years, the old heater, just acting as a blower, is on all the time, to keep the air circulating. If necessary, I do have a lot of bubble-wrap that I could use to make a smaller ‘greenhouse’ within the main one, and put all the valuable plants into that. 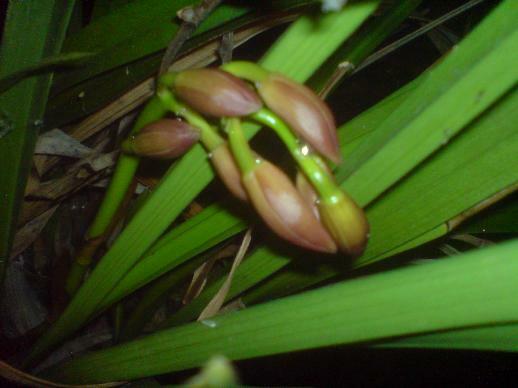 As well as moving the summer pelargoniums in last week, the Cymbidium again is in bud. I fear that neighbours 60′ trees now overshadow the garden so much as to limit summer growth. Unfortunately the Pleonies were killed off by the cold last winter. 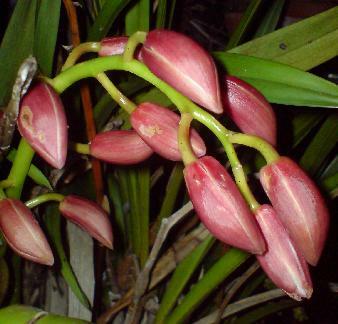 This year's Cymbidium flower bud - only one so far. One new problem is that I find I cannot reverse the Mercedes into the ‘back yard’ at Mother’s – it just will not go, and how I’ve tried. I could get it into the garage, poking its nose out, but I’d have to clear the garage (again, it gets cleared and filled with monotonous regularity), take the doors off, and while the car’s there, not have access to anything in the car or the garage. The reason for this is that the car needs some work to stop the rust now, before it gets serious, but it is the sort of job that could take more than a week (especially at this time of the year), as paint dried, and I cannot block neighbour’s access to his hardstanding for that long. For the second year, I face winter with no gas central heating – a long running legal battle. The tenants in the flat below used to be profilgate in keeping their heating on (which helped keep me warm), but I guess they’ve either moved out without telling their landlord, or else the fuel price has finally forced some economy in their living standards. I’m really not sure which of the two it is! The first thing I check when I arrive at Mother’s (apart that she’s OK) is the greenhouse, as there is still a bit of light. This was the case yesterday, where I noticed the minimum temperature had been just under 2C, and the maximum about 9C. So just frost free, and with the cold air blower running all the time, no damage anywhere. 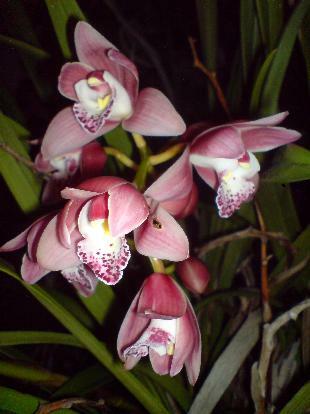 I took this photo of the Cymbidium; although there was still daylight, the camera could not record a decent image without flash, which is why the backgrounds of so many greenhouse shots taken at this time of the year are so dark. This readout device is more sophisticated that the previous one, in that it will record the Max and Min itself, but I never have the instructions on me to learn how to set it up. Although I had adjusted the heater in November, I found I had to make a significant change in the termostat. When I left, the display unit was showing about 4C, having made a peak. I’ll have to try and get Mother to keep an eye on it, as I have found that an East Wind seems to affect the heaters, causing them to go into overdrive and make it a sub-tropical greenhouse. The snow in Mother’s road was untreated and a mess. I just got the car past her house (going uphill), then let it back into her driveway, and parked on the horizontal. On my way there I had seen the evidence of a car that had been parked, but then sliid down the steep hill and wrapped itself around a lamp-post. On the way back, I found that the car would skid at any moment, especially while driving down a steep hill, but along the flat of the valley bottom, and until I joined the Motorway back to London. Keeping the greenhouse frost free – without being there. Two years ago I purchased an Oregon Scientific temperature display unit that had a wireless link to a remote sensor. The remote sensor was in the greenhouse. The reason for this was the terrible design of greenhouse heater, which was just a fan heater with a different thermostat. (I have blogged about this in the past, but on the previous blog whose entries I did not transfer in time are lost). Late last year the readout unit disappeared from Mother’s living room – stolen, I fear, as most everything else that “disappeared” has since been found. The greenhouse had to go through the coldest winter in 18 years with a second dodgy heater (identical to the first that was definately no use, but newer). I set up the old heater as just a blower, and the new one to switch on and supply heat as and when. The reason for all of this is because the greenhouse contains my pleonies, cymbidium orchid, cacti, pelargoniums and the wormery, as well as over-wintering the dahlias etc. Anyhow, come another winter, and no idea how the “new” heater is performing;. I could not buy another unit of the Oregon type (no longer available), and the cheapest one that had a remote sensor was this ClimeMet unit (above). Photo was taken in the greenhouse with the blower non-heater in the background. In reality the display unit lives in mother’s living room. So, from time to time I can ask mother what the temperature is, and on Sundays adjust the heater thermostat if necessary. But that was not why I purchased it – it was the cheapest (indeed possibly the only) unit I could easily get with a wireless linked remote unit. In fact mother has just phoned me up, and in the conversation told me the greenhouse was at 4.4C and 82% humidity. Temp is OK-ish, but at least the heater has not gone mad, and heated the greenhouse to sub-tropical temperatures (a lost blog entry, due to heater 1).